My initial idea for this body of work was a consideration of fear and how it is shaped by culture, for example, fairy tales of ‘big, bad wolves’. Whilst living in Edinburgh, Scotland in 2012/3, I researched topics such as the Scottish landscape and land use, legends and children’s stories, wilderness, rewilding, British explorers and settlers in Canada, including Franklin’s search for the NorthWest Passage on his ships, presciently named, Erebus and Terror. The research resulted in works which explore how human interaction and culture have shaped the earth. Erebus and Terror became a fitting title for two large ‘iceberg’ sculptures. 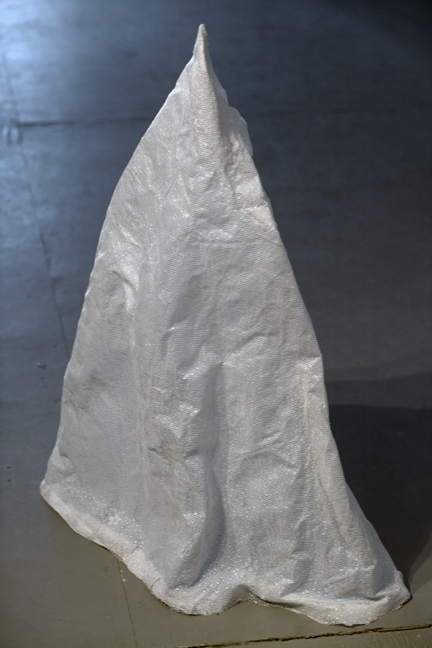 Made of lace stiffened with corn starch, the icebergs refer to the NorthWest Passage; the lace to the luxurious items the explorers brought with them and the promise of a trading route. 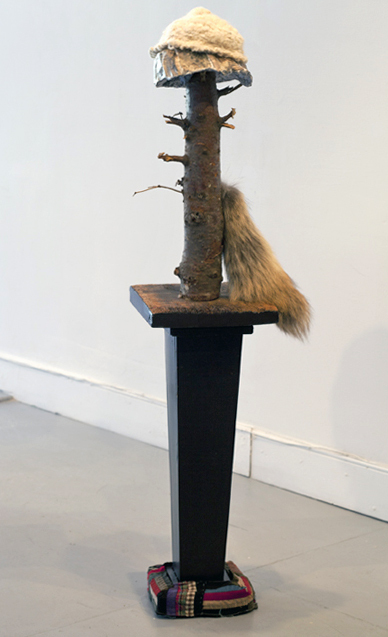 Landscape and Landscape with Coyote Tail are made of found materials and papier mâché forms; they present landscape as ways we use it as resource material for shelter, furniture, warmth, fashion. from land' was made by stop camera animation using oil paint on mylar to create the shots. 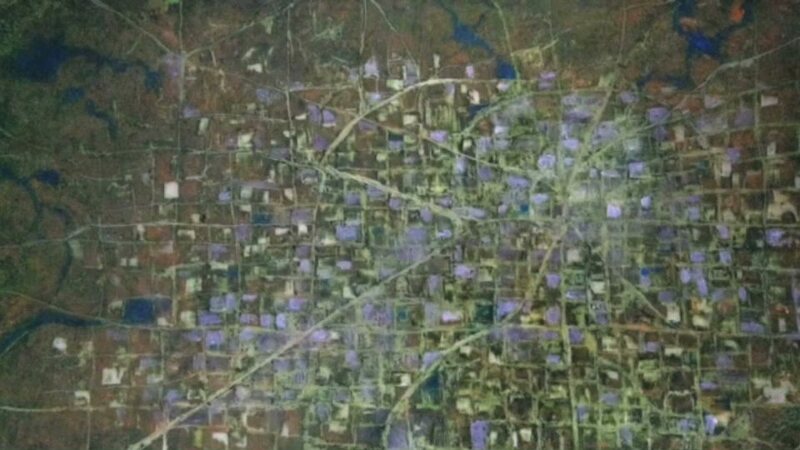 The video presents the earth from an aerial viewpoint as it slowly shifts from wilderness to hunter/gatherer landscape to agricultural to rural to urban and finally, to a mapped surface. It evokes the memory, knowing and loss of our connection to the land. The two collages, Forest Shadow and Rewild are shown on a shelf with the video Landscape Shadow. 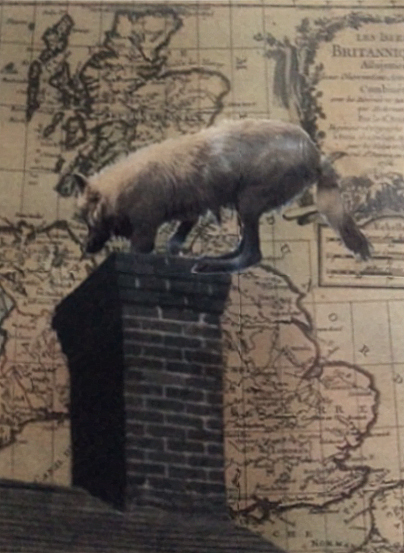 The 3 works feature a wolf: as an absence in the landscape, as a moving shadow, and actively engaging domestic space.